There are over 250 known species of bumblebee worldwide, and 24 in the UK. Only the worker bees and Queen have a sting. The bumblebee is peaceful and not aggressive, even compared to the honeybee. They only attack people when they are threatened. So if a bee is buzzing near you the best thing you can do is stay calm and let it fly away in its own time rather than flapping about, which is more likely to cause you and the bee harm! A cuckoo bumblebee will lay its eggs in the nest of other bumblebees, and leave the workers of that nest to rear the young. This is a clever form of deception which enhances the bee’s evolutionary fitness. During warm summer periods, bumblebees hover at the top of the nest and vibrate their wings in order to circulate the air and maintain a nice cool nest, performing the work that a ceiling fan does for humans. Bumblebees also use their wings to raise their body temperature. Bumblebee species are on the decline in Europe, North America and Asia, predominantly due to the rise in industrial agriculture. This will also have a catastrophic impact on other wildlife which are dependent on these plant species. This illustrates the huge importance of bumblebees and why they are known as a ‘keystone species’. Bumblebees use a combination of colour and spatial relationships to learn from which flowers to forage. They can also detect both the presence and the pattern of electric fields on flowers, which occur due to atmospheric electricity, and take a while to leak away into the ground. They use this information to find out if a flower has been recently visited by another bee. 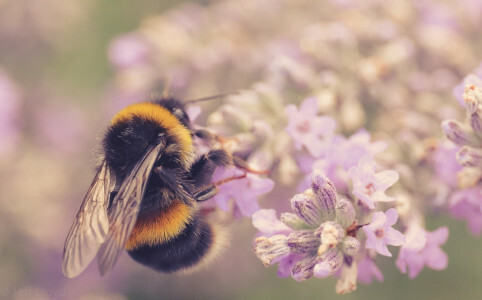 While bumblebees are fascinating and wonderful animals which deserve to be protected for their inherent value, their ecological and economic value is also undeniable, with around one third of human food requiring bee pollination. Many arable and horticultural crops depend on bumblebees for pollination. In some regions where hedgerows (where queens forage and build nests) are scarce, crop yields are already falling. Unlike many other species’ conservation efforts, bumblebee conservation is genuinely something that everyone can play a major role in. A great way for everyone to help bumblebees is to plant wildflowers in gardens or in plant-pots for window-ledges. In Native American symbolism the bumblebee represents honesty, pure thinking, willingness and drive.